Earlier this year, Action Performance Companies Inc. participated in the global media announcement that introduced the James Dean 50th Anniversary program and included information about a cross-circuit racing tie-in that would feature key drivers and teams from the National Hot Rod Association, NASCAR® and World of Outlaws ranks. Next month, the James Dean 50th Anniversary tribute will roll on to Infineon Raceway in Sonoma, Calif. for the NHRA Nationals on July 29-31. 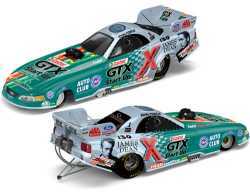 There, the Rebel will join 13-time NHRA champion, John Force, aboard the Castrol GTX Start Up Ford Mustang funny car. Currently, Force is in hot pursuit of a record 14th NHRA funny car championship title. "I’m really excited about the James Dean car," Force said. "I was a big fan of his movies. He was a guy who was larger than life, like Elvis Presley, and his legend lives on today. I was a part of that era, along with Fred Wagenhals. We lived it, so it means a lot to be part of the 50th Anniversary." 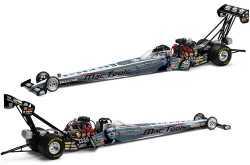 The James Dean 50th Anniversary also will be a featured paint scheme on the Mac Tools top fuel dragster piloted by Doug Kalitta. Kalitta, who is chasing his first top fuel title, also is jostling among the leaders for the top spot in the championship standings. "James Dean epitomized cool," Kalitta said. "He was a rebel and an incredible talent, so I think his legacy fits perfectly with the legend of Connie Kalitta and the radical ways he goes about racing and building his Kalitta Motorsports team. Connie has never backed down from anyone or anything. His talent shows in the performance of our Mac Tools Top Fueler, race-in and race-out. I hope race fans will enjoy the program as much as we will." Action Performance’s Chairman, President and CEO, Fred W. Wagenhals, echoed that sentiment: "There’s almost no one better to showcase the Rebel on a race car than John Force, who came up in drag racing the hard way – the rebel’s way. And, with all of his success, Doug Kalitta continues to build on the Kalitta family racing legacy. I cannot think of two better drivers or more impressive machines to bring the James Dean 50th Anniversary program to the NHRA drag strip." Action, a master licensee of the program through the James Dean Estate and CMG Worldwide, began the primary rollout of James Dean 50th Anniversary merchandise in November 2004. In addition to die-cast collectibles, the James Dean 50th Anniversary product line includes fashion apparel, headwear, accessories and gift items. Merchandise from the James Dean 50th Anniversary collection, including NHRA specialty die-cast replicas, is available to order via a special e-commerce Web site: www.jamesdean50.com. The site also references ongoing Dean tributes and other related festivities throughout the year. Additionally, Force’s Castrol GTX Start Up/James Dean 50th Anniversary Ford Mustang funny car and Kalitta’s Mac Tools/James Dean 50th Anniversary top fuel dragster die-cast collectibles will be available through Action’s standard distribution channels. To reach an Action Racing Collectables distributor, call the locator line at 1-800-411-8404. The Racing Collectables Club of America can be reached at 1-800-952-0708 or visit RCCA online at www.goracing.com. For a list of authorized ARC dealer locations, use the locator tool located at www.action-performance.com. On Sept. 30, 1955 while en route to a race in Salinas, Calif., 24-year-old James Dean, behind the wheel of the Porsche 550 Spyder, was killed in a highway accident. His death preceded the release of the most widely acclaimed film of his tragically short acting career, Rebel Without a Cause. Action Performance Companies Inc. (NYSE: ATN) is the leader in the design, promotion, marketing and distribution of licensed motorsports merchandise. The Company's products include a broad range of motorsports-related die-cast replica collectibles, apparel, souvenirs and other sports-inspired memorabilia. Action Performance markets and distributes products through a variety of channels including the Action Racing Collectables network of wholesale distributors, the Racing Collectables Club of America, QVC, goracing.com, trackside at racing events, direct corporate promotions, mass retail and department stores, specialty dealers and select online retailers. For more information about Action Performance and its many subsidiaries, please visit the company's corporate Web site at www.action-performance.com.